m a y f i l e s . . .: Where have I been? 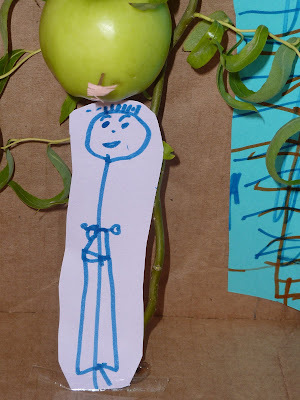 Callista's version of William Tell's son with an arrow shot through the apple above his head. Remember all those tomatoes? Now I have dozens of quarts of stewed tomatoes, soup and sauce. Remember the apple trees? Apple sauce. Sometimes the blog has to take the back seat. Yet another way our apples come in handy. Field Journals. We drew pictures of each plant before hand and looked at pictures in plant identification books and on the internet. Then on our field trip the girls were able to pick out the plants on their own. That is when they weren't shivering and crying about the freezing wind! and did a leaf chromatography science experiment (this gives the children a visual of all the different pigments present in leaves. 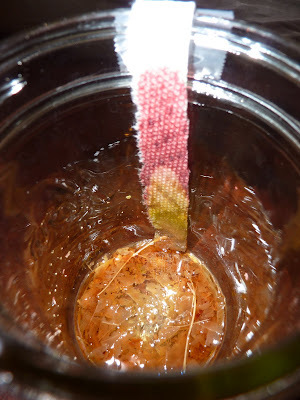 We ground up our leaves and let them sit immersed in rubbing alcohol. Then we allowed the tip of a strip of paper towel to touch the alcohol solutions. After several hours the girls saw the hidden colors of the leaves! This fit nicely as we learned about fall and the changing color of leaves. We spent a wonderful week with Brent's parents in town. The children played. Mimi joined us on a freezing leaf collection field trip to the mountains. We engaged in stimulating conversations on the economy, nutrition, religion and politics. We ate great food. And just enjoyed each others company. You HAVE been busy! Looks like so much fun. :) Thanks for the birthday call! We'll have to get together soon! We do have a lot in common! I've been out of the blogging world for a while now. Since I've been thinking of homeschooling for a while, I ordered catalogs and have been researching. My favorite? Sonlight. Kind of crazy to then read that on your blog. I love a lot of things about Sonlight. Especially the focus on quality literature. I do find I come up with a lot of enrichment on my own, which is time consuming. I also change the religious aspect align more closely with our church. I so highly recommend homeschooling however. I love it. I can't imagine ever giving it up! I will probably choose a different program next year...not sure yet. That leaf experiment looked really neat! I forgot to ask you how the applesauce went over the weekend. Did you have some this morning with your hot cereal? Yum!